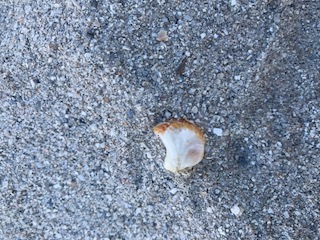 As I walked on the beach collecting shells, I reminisced about a previous Miami Beach trip and reflected on beauty. I am blessed that I recently had the opportunity to travel to Miami Beach for a trip that was both business and pleasure. However, any opportunity for me to go to the beach is pleasure. The last time I was in Miami Beach in 2009 after I had had my mastectomy, oophorectomy and completed 16 rounds of chemotherapy. I had started, but not finished reconstruction. This was the trip of a lifetime with my lifelong friends at the end of almost one year of fighting breast cancer. The fight took a toll on me mentally, spiritually and, especially, physically. I had been at a wedding before my girls’ trip, just as I finished chemo. I had been in a lot of weddings before where the bridesmaids had to change in a shared room. I was never very self-conscious before, but I was extremely self-conscious and anxious as I began to change into my bridesmaid dress, working to make sure I didn’t knock my wig off or get it twisted. 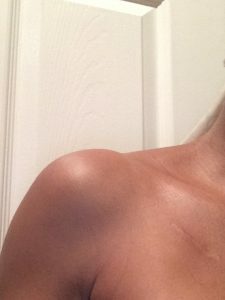 I changed in a corner, turned toward a wall for “privacy”, not wanting anyone to see my awkward misshapen breasts or the bulging scarred area where I still had my mediport. When I got to my Miami in 2009, I was still rockin’ my wig because my peach fuzz hair was growing in patchy and had me looking like a Q-Tip®, completely white. My mediport had been removed, but left behind a scar and there were all those other scars from my mastectomy and reconstruction and scars where my drain tubes had been. I think my discolored black nails (not painted black, but black from all the meds in my body) had started to return to their normal color. Not the societal definition of a 39-year-old beauty queen; lots of imperfections. I wore my wig like Linus carried his blanket, my security. I wore outfits that could hide my scars. Fast forward to my 2018 Miami Beach trip. Yes, I wore my first two-piece swimsuit in several years. I wore strapless halter dresses two days in a row with no place for my mediport scar to hide. 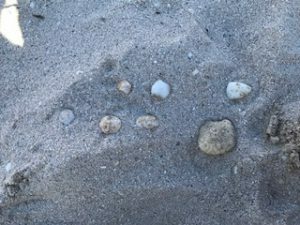 As I walked along the seashore on the beach (hands down one of my favorite places on earth) I was doing what I do on the beach – collecting seashells. 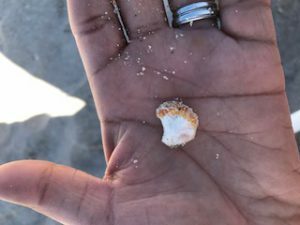 I think seashells are beautiful. For so many years, I’ve been predisposed to getting shells with the perfect clamshell shape and with curves and exterior ribbing. I would always go for those that seemed intact, but not this trip. I was drawn to some of the less “perfect” shells, those with chips, knicks and other blemishes and imperfections because of how I now embrace beauty. Laying on the beach with the beautiful people in a society that can idolize and admire airbrushed beauty, I was at peace and comfortable in my own skin. Throughout my battle with breast cancer, I was adjusting, trying to own this body, these changes and transformation, these blemishes and scars. I’ve spent countless hours in the mirror looking at my “new” body. The scars have faded over the years, but never gone away. I’ve transitioned from wearing my scars like a scarlet letter, a badge of shame, to being unafraid of wearing outfits that show my scars and now wear it as a badge of courage, a symbol of my strength and that’s beautiful. As I collect the shells with blemishes and imperfections, I still admire their beauty. And, as I look in the mirror with my blemishes and imperfections, I embrace my beauty, scars and all. See more of my reflections at https://www.youtube.com/watch?v=Sy7uXmXfnKU.